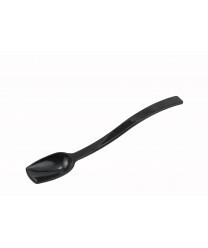 Part ot the polycarbonate buffet spoon series, the Winco PSSB-10K Black Salad / Buffet Spoon, 3/4 oz. will be a valued serving spoon on any buffet line. With a comfortably curved 10" handle, and durable construction, this black buffet spoon can be used to serve anything from rice to vegetables; sunflower seeds to almonds and cranberries; and many other condiments and side dishes on the serving line.